LED Par fixture with 5 x 12-Watt 6-IN-1 RGBAW+UV HEX LEDs. 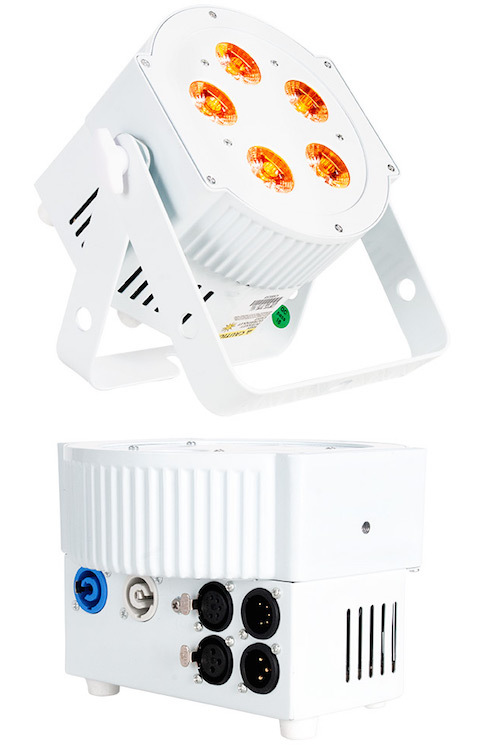 Now with powerCON In/Out, plus 3-pin and 5-pin DMX In/Out, attractive white finish for lighter interiors. The ADJ 5PX HEX PEARL is a versatile LED Par fixture with 5 x 12-Watt, 6-IN-1 HEX LEDs made from all metal construction in an attractive white finish. With a 30-degree beam angle, users may produce wide washes with smooth color mixing from 63 built-in color macros utilizing red, green, blue, amber, white and UV LEDs. Not only is this LED Par great for lighting stages, but with its patent pending, intelligently designed, power and DMX connectors, it’s great for uplighting a venue, or used as a stage wash.